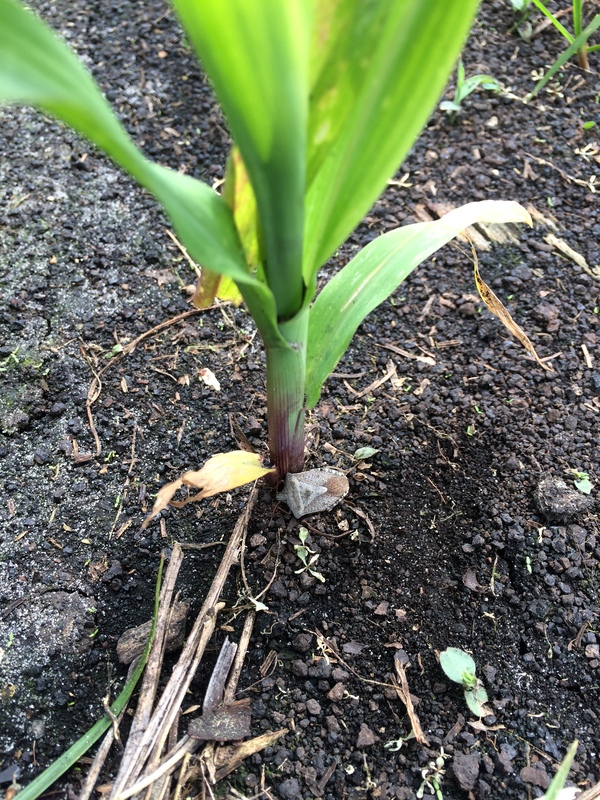 Brown stink bug feeding above the crown of seedling corn. This will result in leaf holes, but probably not stunting, tillering, or plant death. Stink bug pressure is already heavy this year. A lot of seedling injury has been reported (see previous article). This is caused from adults that overwintered from last year, either in soybean stubble, woods, or weeds. 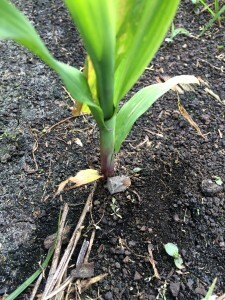 The most severe injury results from feeding on the crown, but stalk feeding (see photo) should only result in foliar injury (photo in previous article). Corn that is V2-V8 will be susceptible to stink bug injury. The earlier the stink bug hits the plant, the more severe yield loss will be during these stages. So our static threshold at this stage is not very good. Stink bugs that hit seedling corn will create a new generation on weeds or wheat. These are the ones that can really hurt corn by moving from weeds when they dry or wheat when it is harvested. Rice stink bugs (see photo) love wheat, but are not a corn pest. Brown stink bugs (see photo) also love wheat and are a corn pest. We really need to watch (scout) corn once it is waist high until it tassels. This is the stage where stink bugs can cause a disaster by feeding on the ear as it develops. Once corn tassels, the ear is already pushing out and most of the injury has already occurred. It may be tempting to tank mix and insecticide with a fungicide. You need to decide whether you want to target the spray optimally for the fungicide or the insecticide, since these two timings don’t overlap. A threshold population of stink bugs before tasseling justifies the cost of the trip over your field. Brown stink bug (left) and rice stink bug (right) adults. 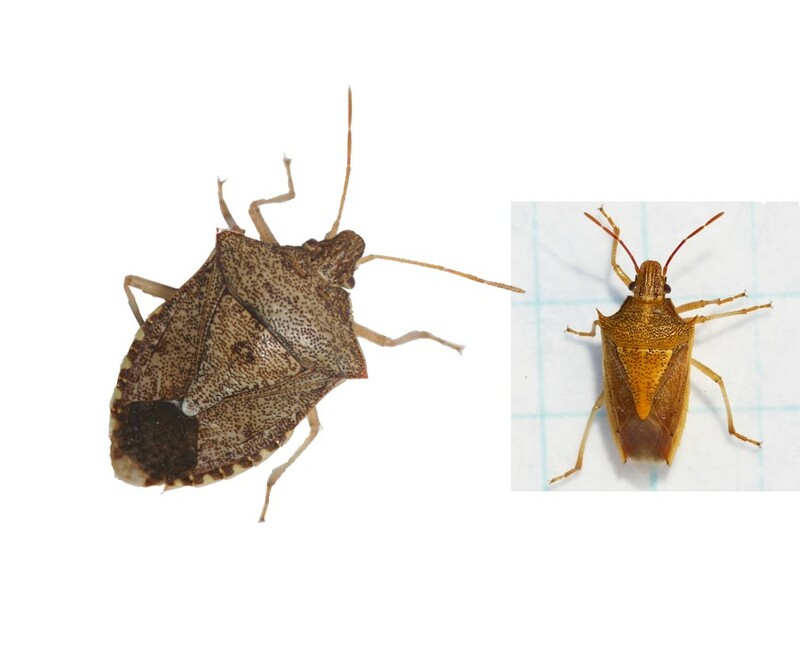 Our threshold for spraying stink bugs is one stink bug per four plants when the ear is forming, during ear elongation and the beginning of pollen shed and one stink bug per two plants nearing the end of pollen shed to the blister stage. I am willing to shift this threshold up to one stink bugs per 10 plants when the ear is forming to be extra protective. Numbers this high are still rare. Finally, we have published information from NC that demonstrates the ineffectiveness of aerial insecticide applications over corn when they are applied at tasseling and using the typical fungicide spraying method (Insecticidal Management and Movement of the Brown Stink Bug, Euschistus servus, in Corn). Stink bugs are difficult to kill with aerial applications because the insects can hide in leaf folds near the stalk. Make it clear to your aerial applicator that you want to penetrate the canopy and kill insects. There are aerial applicators that can kill stink bugs based on follow ups we’ve made in the field after sprays. Stink bugs can be killed for up to a week using a high-clearance tractor (see screening information graph). Don’t expect much, if any, residual from your chemical. Stink bugs can reinvade the field after sprays. 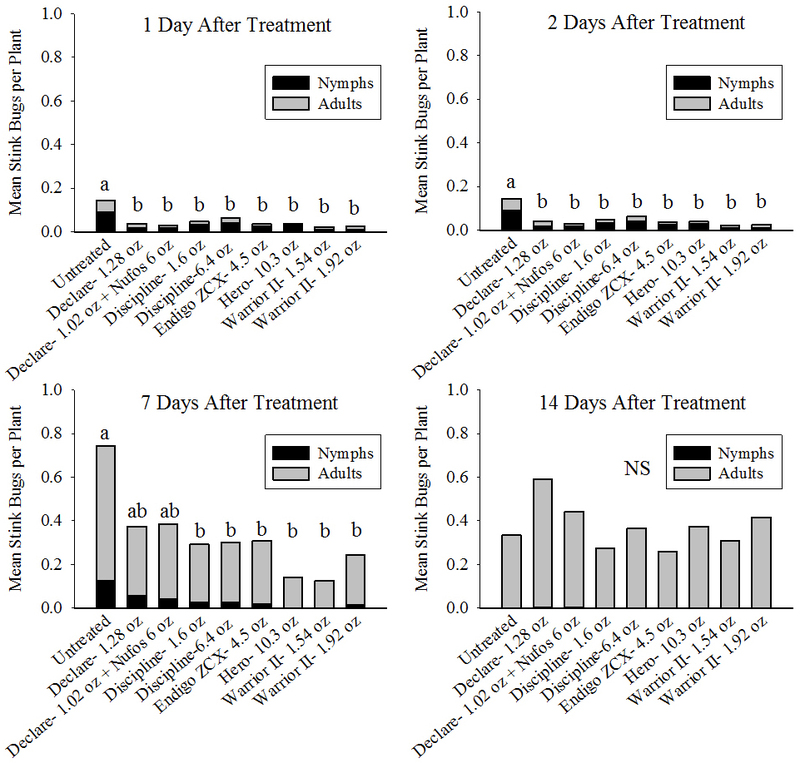 Number of brown stink bugs per plant at one, two, seven and 14 days after treatment.